Ron Paul, whose surprising meteoric popularity stunned the Republican Party, has called upon third party Presidential candidates Ralph Nader, Cynthia McKinney, Chuck Baldwin and Bob Barr to attend a joint news conference proposed for Wednesday to encourage people to forsake the DNC and RNC Presidential candidates. 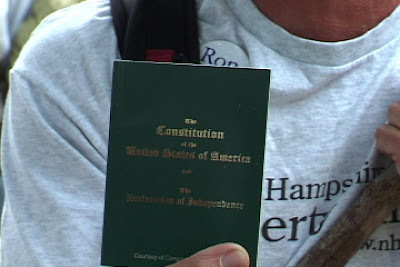 Ron Paul delegates were rebuffed at the Republican Convention held last week in Minneapolis, denied microphone time or opportunity to have their votes counted, according to delegates attending protests outside the RNC Convention. While Republican insiders said they tried to court Ron Paul delegates, many libertarian leaning followers remained resolute in their hopes to assert their emphasis on restoring Constitutional rights, which has failed to make the party’s platform as well as immediate withdrawal from Iraq and elimination of the Federal Reserve..
Nader and running mate Matt Gonzalez, who held Super Rallies in both Denver and Minneapolis during the two parties’ conventions, also invited Baldwin, McKinney and Barr to participate in their “Open the Debate” Super Rallies held in both Denver and Minneapolis during the two parties’ conventions. 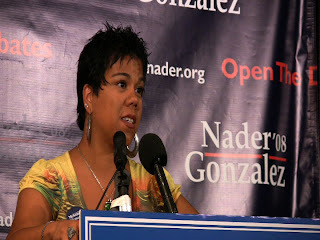 The Green Party Vice-Presidential candidate, Rosa Clemente enjoyed a ready audience at both venues. The Nader campaign has just completed getting on their 45th state ballot. Despite this achievement for an independent candidate, news coverage has been slim for Nader, ironic since he was so vilified by Democrats and sneered at by Republicans for George Walker Bush’s win in 2000. According to most recent polls, the Democrat Barack Obama and Republican John McCain are neck and neck in the race. A unified voice from both libertarian and socialist leaning parties ( otherwise called fringe by the mainstream) could help to open up the debates and alter the depth of media coverage offered to all the candidates. “This is the beginning of the realignment of American politics,” Nader said.